Too Much Mulch: It Can Kill Your Tree! It’s been a chilly winter and we are so glad to see Dallas residents and businesses applying mulch in their landscapes and around their trees. However, we’re seeing that many homeowners or landscapers have applied too much mulch around the base of their trees. Sometimes too much of a good thing can be a bad thing! 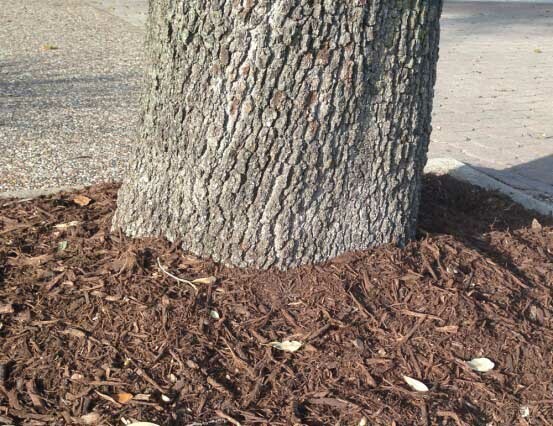 When you apply mulch as seen in the photo below, moisture gets trapped against the bark of the tree, softening it and allowing for pests and pathogens to easily pass through under the bark. Over time, this can lead to disease, decline and eventually death. During that time, the tree can become week and hazardous to your family and home. Rather than pile mulch around the base of your tree, instead put down an inch of much around the base of the tree then create a taller “donut” of mulch a couple of feet out from the base of the trunk. This is generally referred to as a “berm”. In essence, you create a moat that catches water and allows it to be better absorbed by feeder roots, rather than trapping it against the trunk. Have more questions about using mulch properly? Email us through our Contact Page or ask us directly on Facebook or Twitter.